When our girlfriend group of En Vía volunteers (they are girlfriends, though age-wise could all be my daughters) decided to go out to the fiesta in the village where we work with female micro-loan borrowers, it took a little advance planning. 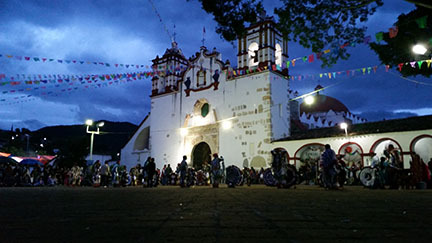 Though it’s only about 25 miles from Oaxaca City, Teotitlán del Valle is a bit of a challenge for evening activities. Getting there isn’t too bad; we waited for the direct bus for a while but found a colectivo who would take us straight to the center of town for 20 pesos (about $1.20) apiece. 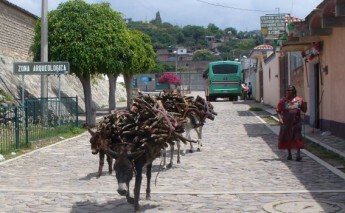 Coming back would be the issue, as the last buses leave for Oaxaca at 6:30. Luckily (because my friend Michelle frequently uses his taxi services and I had his number), driver Felipe signed on to pick us up after the fireworks were over. We got into town about 7, hit a couple of rug stores and checked out the new bathrooms that En Vía borrowers Enedina and Teresa are adding to their store/café. Enedina took us into the family altar room to show us the elaborate beeswax candles, two- to three-feet high and covered with intricate wax flowers, that had been offered by friends and family for her daughter Yanet’s engagement party earlier that week. She painstakingly unwound a couple of flowers for each of us and joked that if our taxi back to Oaxaca didn’t materialize, we could sleep over on rugs on their tile floor. 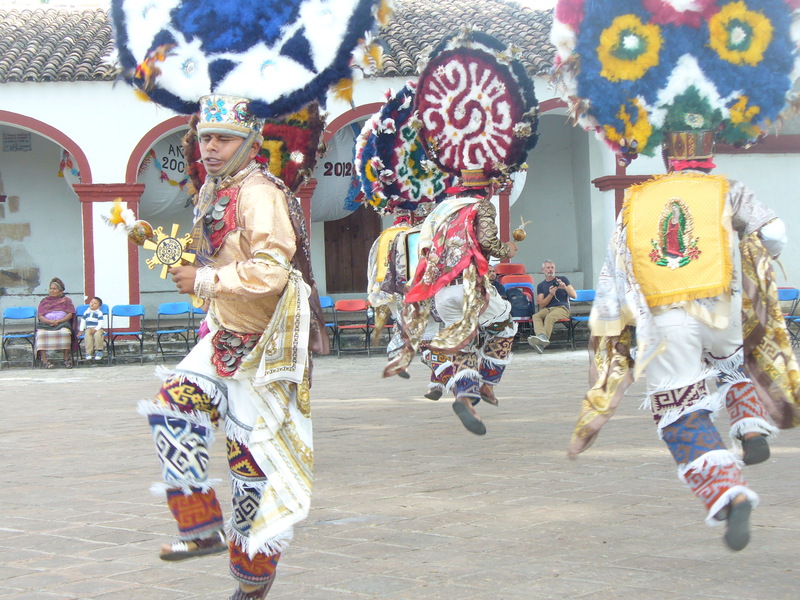 At the plaza in front of the church, the Danza de la Pluma – the danced story of the conquest of Mexico that’s only performed three times a year – was winding up, the troupe of all male dancers leaping gracefully under the weight of 30-pound headdresses. Most of us had seen parts of it before (the whole version goes on for hours, and we know how it all ends: the Spaniards run all over the Mexicans) and it was beginning to drizzle again, so we headed out to the street to see the secular part of the festival: food and carnival rides in the two streets around the church and town market. Nobody from a first-world city would have been impressed with the street fair, but for a town of 5,500 people with no movie theatre, video game center or other form of entertainment (other than a basketball court), this was pretty great stuff. There were bingo tables to win all kinds of household items like giant pots and trash cans, bounce houses and trampolines for the kids, a couple of tiny merry-go-rounds and rides, and booths to throw things at. Oh, and a shooting gallery. 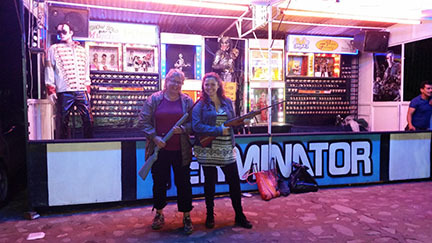 Annelise and I ponied up the 25 pesos to get 12 shots with an air rifle. Now, I have to say here that I grew up in Texas in a summer camp among all boys, and I do actually shoot real guns: rifles, shotguns and pistols. Bows and arrows too. It’s just never come up as a résumé skill here in Mexico, though it does cement the stereotype of Texans that many people have. The targets were little metal buttons that set off various scenarios: Michael Jackson, some singing cowboys and skeletons, and a creepy “just for women” set of dolls that gyrated to “Macho Man.” By the time we’d finished the round, a crowd had gathered. 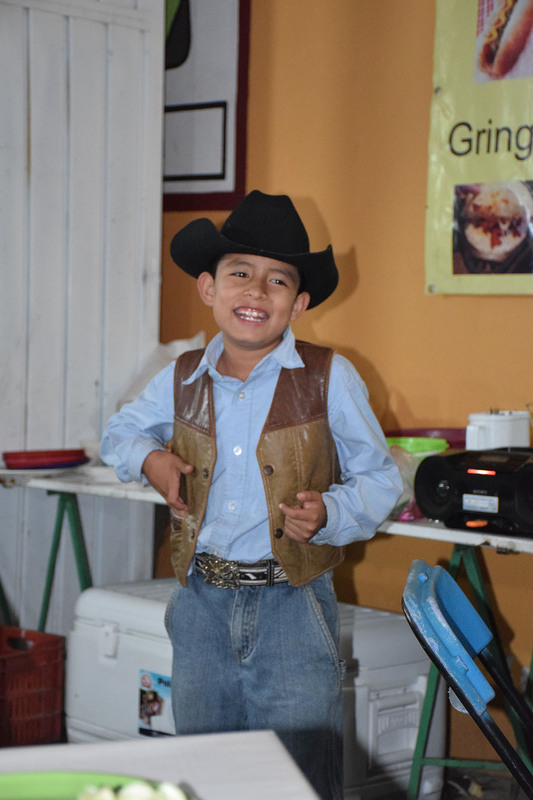 The best (and almost only) place to grab a bite seemed to be the taco stand, and eight-year-old Mauricio – in full cowboy garb and hat – took our orders with a choice of chorizo, tasajo or pastor filling. We were already pretty impressed with his friendly manner and waiter skills, but once he lay down the order pad the magic really happened. He turned on the boom box, grabbed the mike . . . and out came a voice that would have made Simon Cowel weep with the discovery of it. He strutted, he made sad faces at the parts about losing his heart, he pointed to each of us in turn as he sang about the loose women in cantinas. 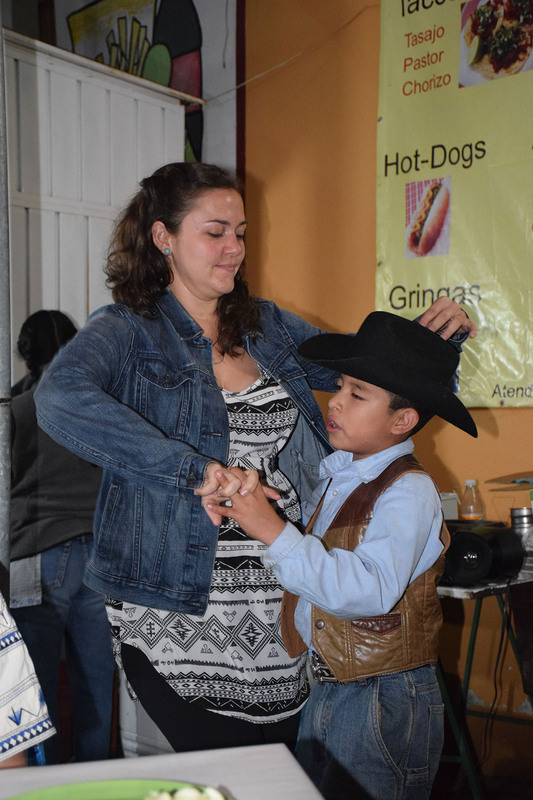 He made his way around the table, holding out a hand to each as he did a little two-step and invited us to sing the choruses (sadly, none of us even came close to knowing the words, although I did get a few out on my selection of Cielito Lindo). A little girl at the next table looked at him with moon eyes; girls of Teotitlán, watch out in half a dozen or so years. We all wanted to wrap him up and take him home with us. 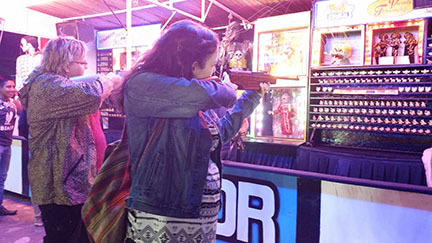 After we paid for our tacos (at 6 pesos or about 35 cents apiece, a full meal was barely more than a dollar), there was time for one more round of shooting. While I’d nailed quite a few of the targets the first time, I have to modestly say here that on the second round, I went 12 for 12 hits. Just saying. Then we headed back to the church across the street for the fireworks show. They had said they’d start at 10, but we’d forgotten that Teotitlán doesn’t observe daylight savings time, so it would actually be 11 by our watches set on Oaxaca time. It was drizzling again and we shanghaied the wooden bench up against the wall. The ceremony started with a file-by of the heads of the cargos, or duty committees which stand in for state or federal taxes in the indigenous villages that practice usos y costumbres. They each shook hands with some head honcho in front of a stacked box holding several bottles of mezcal, gave the open-palmed “thank you,” and headed over to . . . our bench, where we evidently had commandeered the VIP seating. We got up in a hurry and took standing places on the sidewalk, though I’d thoughtfully brought my folding camp stool (remembering the last time I’d stood for hours watching fireworks). 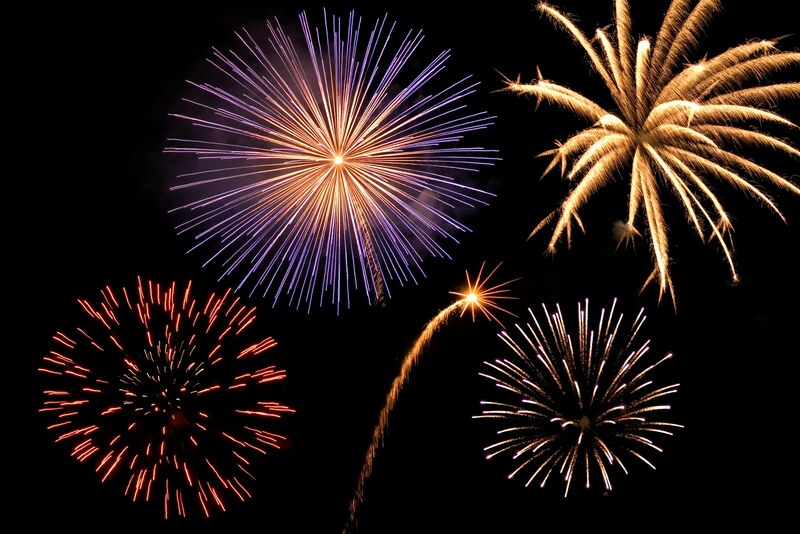 A historical note here: fireworks came to Mexico with the conquistadors and their military gunpowder, with pyrotechnic popularity growing in the 19th century after Mexico’s independence. Fireworks production, sales and handling are regulated by the federal Armas, Municiones, Explosivas y Pirotecnia law enacted in 1963. 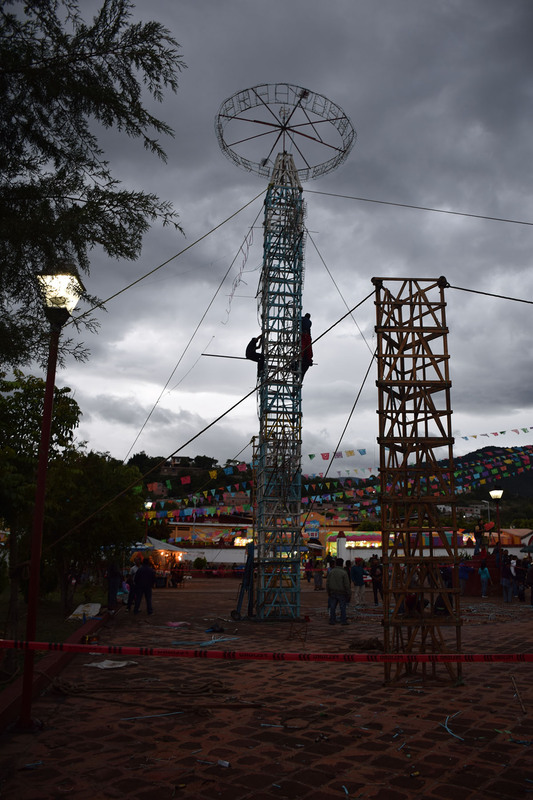 Castillos are a main staple of Mexican religious festivals, particularly those for patron saints. At around 11, two women began the festivities with huge flaming headdresses of sparking fireworks. 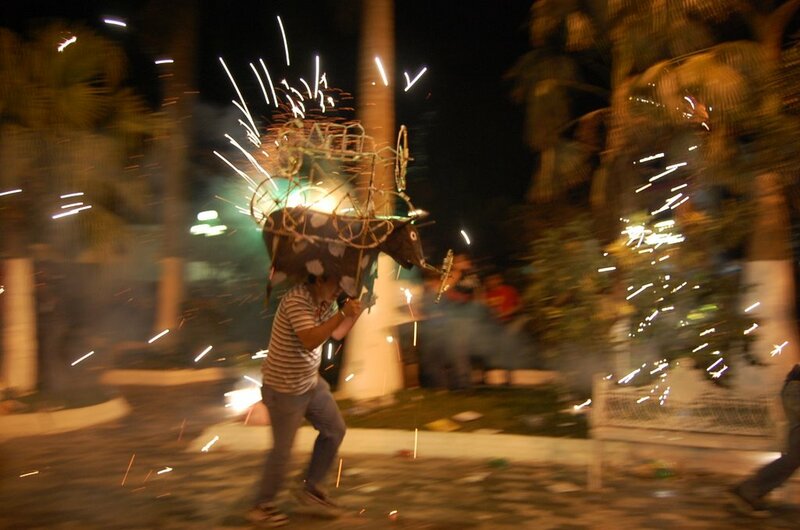 Toritos followed – normally there are up to half a dozen or so preceding a castillo, with a person dancing under a papier-mâché bull head that flames furiously around the dancer and sends showers of sparks into the crowd. There were not only toritos, but pavo reales (peacocks), maybe 20 in all, lasting a full hour leading up to the big fireworks show. The last torito was so huge that the dancer couldn’t balance it and it tipped over, drawing a huge sigh of alarm from the crowd and causing several of the pirotechnica dudes to rush over and help him get it upright. A second dancer quickly took over the bull. At midnight, the sparks fading from the last huge torito, they lit the castillo. And what a show. The lower wheels spun in unison with flaming hearts; the middle wheels had whirling communion cups, and the upper layer had pure white crosses. 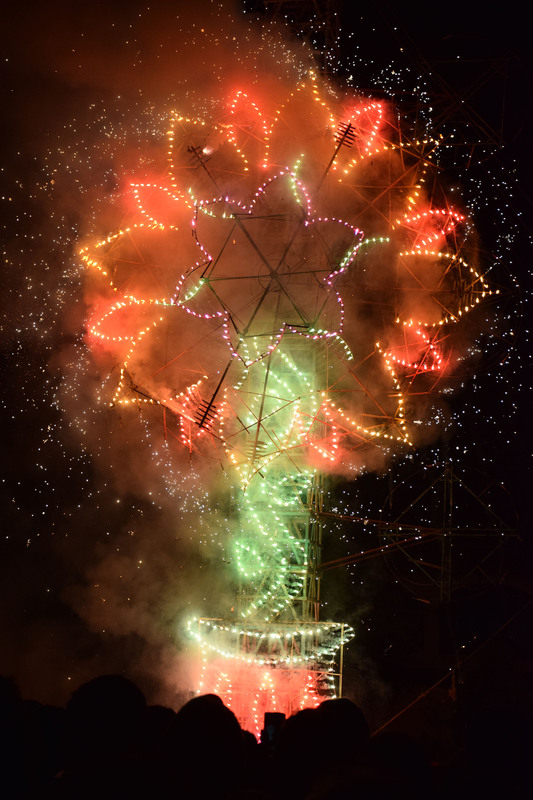 After they burned out, two huge wheels in front spun flowers into electric kalaidoscopes. 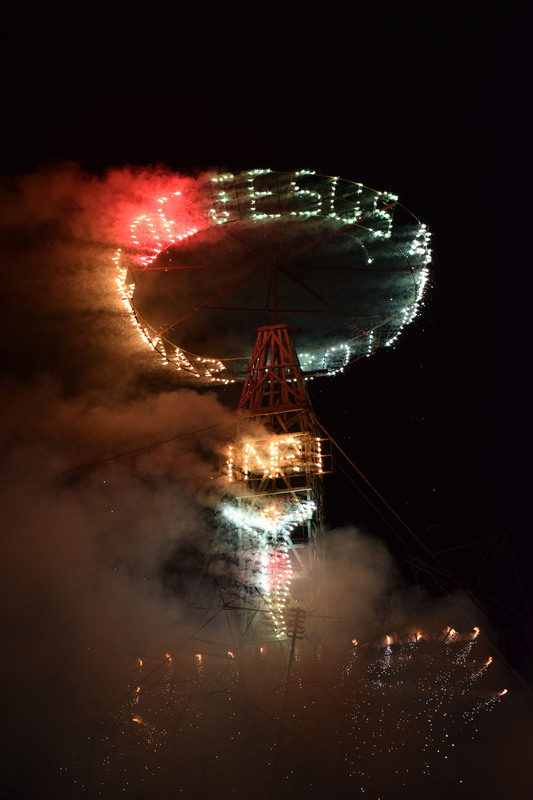 The top wheels spelled out “bless our village” and “precious blood of Christ,” which is the name of the town church and patron saint, with an electric crucified Jesus at the very top. And then the lit-up wheel levitated and disappeared into the velvety black night sky. There were overhead fuegos artificiales (fireworks) and when it all ended, a breath of silence followed by raucous applause. Our driver, Felipe, appeared; he had not surprisingly been able to find this group of tall gringas even in the crowd of several hundred. The whole night was pure magic. Good for my aging ego with the bizarre skills sets of being able to hit targets with an air rifle and knowing a few words to the chorus of Cielito Lindo. Fun friend time in a setting not likely to be replicated any time soon. We had souvenir wax flowers, left in Enedina’s shop until the fireworks were over, some great photos and a video of me singing on Facebook that will probably go viral. 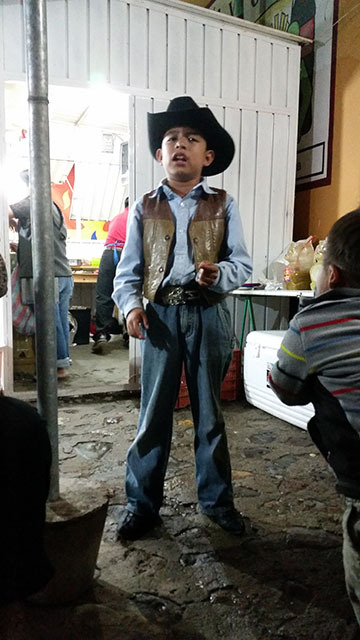 But most of all, we had danced and sung with Mauricio, who has a great future ahead of him. I’ll keep you posted on that. P.S. Don’t know what I was thinking going out to the fiesta with no cellphone or camera, but thanks to friends Annelise Hagar and Kendall Banks for sending me their photos. Kendall volunteered for En Via several months here last year and now is working for Semilla Nueva, a nonprofit involved in sustainable agriculture based in Guatamala City. Fellow En Via guide Annelise had the good fortune to have a Mexican mother and takes us all to school with her perfect bilingual abilities. She was the one chatting up Mauricio, though he really didn’t need much encouragement.